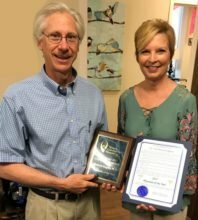 2017 Physician of the Year: Dr. Richard Rogers! In honor of National Doctor’s Day, Yoakum Community Hospital hosted its Annual YCH Choice Award, giving employees and patients the opportunity to nominate the Physician of the Year. Many nominations and comments were received praising the doctors and their many honorable qualities, but one stood out from the rest: Dr. Richard Rogers! Dr. Rogers is a Gastroenterologist from Victoria, who has been treating patients at YCH since 1998. 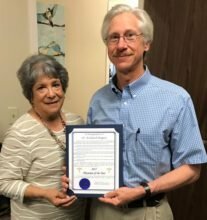 Mayor Annie Rodriguez and Karen Barber presented Dr. Rogers with a commemorative proclamation and plaque congratulating him for receiving the honor of YCH Physician of the Year!